While our neighbor children are sleeping in for the last couple of days before the routine kicks back into high gear, and while parents are wondering where the summer went, new educators spent today getting oriented to Plainfield's schools. 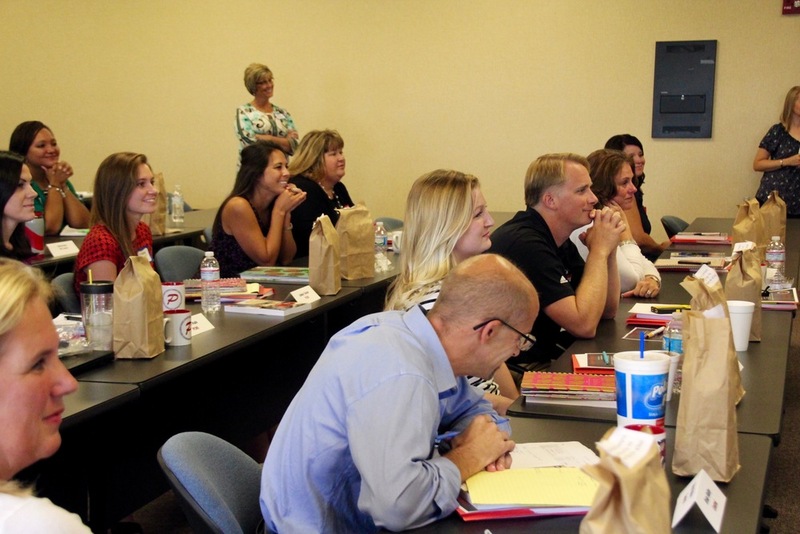 We are welcoming 25 new faces to the #RedPride family, and each of those teachers and administrators will work as a cohort, throughout the year, learning about different phases of Plainfield schools. Today we talked about technology and communications and benefits. And our school leadership shared their expectations with our newest teachers and administrators. I've wanted to teach in Plainfield forever. The buildings and classrooms are beautiful. Getting the chance to come here was too good to pass up. The kids that I've met have been great. One teacher, mother to a young child herself, added this: "I've taped a little note to my computer monitor this year, and it says 'Am I teaching these students the way I hope my child's teacher will teach him?'" As the assistant superintendent over Student Services, Dr. Mary Giesting stressed our top priority: PCSC teachers are expected to love our students. While there are many other technical, legal and educational expectations, it really begins and ends with that. Love our kids, first and foremost. The rest will fall into place.